Applications may be obtained from the office or store locations or printed from the file below. Submit completed preliminary applications to the office. Resumes will be accepted. 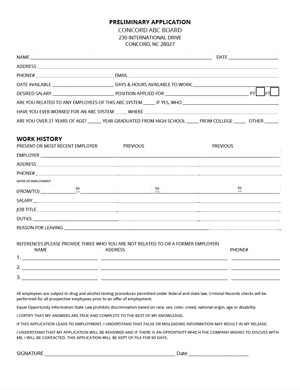 Click on the button below to print or download the Preliminary Employment Application. If you save it to your computer, you will be able to fill out the form on your computer and then print and sign before you return it to the Concord ABC Board office. Welcome to the City of Concord Alcoholic Beverage Control Board website. Learn more about the City of Concord and our surrounding area at the Cabarrus County Convention & Visitors Bureau website.